In 2014 a Minister for Portsmouth was appointed from Central Government - Not So much a Unitary Authority then ? - The notion " don't rock the boat we are unitary, too powerful, and can do what we like " from Portsmouth City Council appears to be eroding. The concept of an all mighty self-governing Portsmouth is being considerably diluted with the Portsmouth - Southampton merger toward a Solent City taking shape. - Arguably, the truth is it's the big Portsmouth sell out to gain financial support from Southampton - A deal which will incorporate a joint committee in return for £10's of millions. Predominantly, the reason is the failing to keep shipbuilding and Naval services in the City, along with the deficit running costs and £32 million pound outstanding debt in 2016 of the Super- hospital which serves the Portsmouth and South Hampshire region. The loss of a 600 year tradition of shipbuilding in Portsmouth has had an adverse effect with over 800 jobs lost, and an industrial / economic snowball effect incurring further looses in the area. The implications suggest a significant shift in the pattern of UK critical infrastructure and defence Mechanisms , as Portsmouth has always been strategically placed at the centre of the south coast. The Naval Hospital HASLAR in neighbouring Gosport suffered the fate of closure some years prior, and made way for alternative development, much like the Royal Marine barracks which are now residential homes and apartments. Recent events, coupled with the crippling financial costs of the Queen Alexandra hospital, and naval activity being moved elsewhere, it is little wonder that a Minister for Portsmouth was appointed from Central government in 2014. The spiral costs had since, led to speculation of a Southampton trust to take control of the management through the NHS trust. In 2015, such was the situation Portsmouth City Council approached the government for a £7 million loan to ease the problem. A number of other large international organisations have also abandoned their business activities within the Portsmouth boundary: The relocation of BAE shipbuilding was, of course, the most highlighted by the media, but the departure of others, for example, Scottish and Southern Electricity, and Zurich, have been equally damaging. Events took a turn for the worst at the City Council prior to the appointment of Michael Fallon, MP from Westminster , when Portsmouth MP was accused of employing a Russian spy (Katia Zatulavita) as a researcher in the defence sector. The scandal, much documented led to national debate, and when considering other events, such as the arrest of WPC Rebecca Swanson for her involvement in a drugs cartel, it is clear that all is not well with the authorities in Portsmouth City. On the ministerial appointment, it came as no surprise to residents, when the leader of the then council Vernon Jackson resigned. The irony, is the amount of people involved in Portsmouth politics and Portsmouth development who are not from Portsmouth, both Mr Hancock and the leader of the then Council are Fareham residents, along with other councillors who sat in Chambers. Fareham is a borough outside Portsmouth, between Portsmouth and Southampton, which, it could be argued, stands to gain much with the development of the Solent City. Even the Portsmouth North MP (Penny Mauduant) has moved her office out of the City to the very edge near Portchester and nearer Fareham. The question is why, is it more convenient to her home address, or is it more convenient to the Solent City project - Effectively Portsmouth is an Island and those Portsmouth North Residents who wish to attend an MP surgery now require transport to get there. 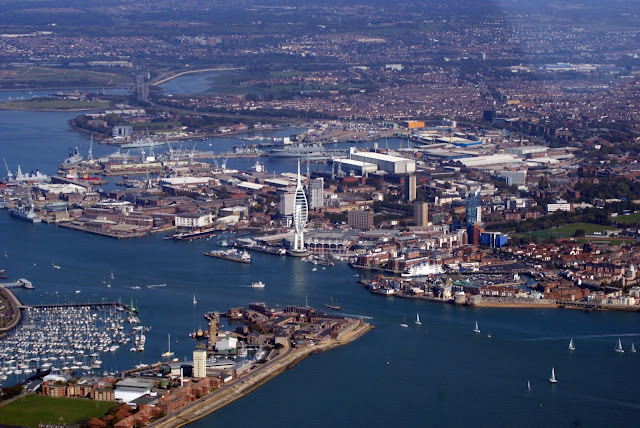 The City council may well consider the development of the Solent City a future of prosperity for both Cities, however, it clearly erodes the identity and tradition of Portsea Island and Portsmouth as a whole. The failings of the City and the recent events have without doubt cast a shadow of doubt over City council policy and their integration with the everyday residents. - It appears that the interests and the investment have been geared away from " the best interests of the local people, and more toward the self-interests of the Solent City development crusade". - It pains me to say it, but those involved had been so self - indulgent, conceited, and arrogant - they deserved the embarrassment of having to go to the central government for a loan to bail out the hospital, and they deserve the embarrassment of being bailed out by another City. Portraying the image of the Solent City being a positive development for Portsmouth is, arguably, a smoke screen for the City's failings. The General public can see through it. The question is, will an interim cash injection, and a further attempt at a gentrification process provide a sustainable future for the economic and social development in the City ? Or, is it a desperate attempt to find a quick solution to a longer and much deeper routed problem ? One could argue that the appointment of a Government Minister for Portsmouth was long overdue, but the identity of Portsmouth being "Home of the British Navy" could well be in danger of transpiring into the "Museum of the British Navy". Phillip Paul Dennis (C-1610-2016) is an inspector, combining academic and office skills with practical work based skills which enabled him to attain First Article Inspector status. Formally educated at Portsmouth University, reading geography and geographical science, he graduated with honour, and successfully completed an independent research dissertation in geopolitics by conducting a geographical enquiry into the social contract theory and the development of nation-states. In 2010 he achieved a UK-TEFL Cert at Cambridge UK, and was previously awarded distinction by the London City and Guilds Institute for computer aided engineering in 1992. In 2013 he was part of the university alumni networking group, attending events & functions, and has represented geography & geographical science as a delegate for a reception evening at the House of Lords, in Westminster, London.